Works with 802.11a, 802.11b, 802.11g, and 802.11n wireless routers and access points. Note The Xbox 360 console has built-in Wi-Fi and a wireless networking adapter is not needed. The adapter is not receiving power. Unplug the USB connector, and then plug it in again. If there’s still no light, try plugging the adapter into a USB port on the front of the console. If the adapter works in the front USB port, see The wireless adapter works in some USB ports, but not in others. If it’s still not working, the adapter might be experiencing a hardware failure. Order a new adapter from the Xbox Online Service Center. Note Product registration may be required. The adapter is connected to a wireless router, gateway, or access point. Black adapter with two antennae (wireless N adapter): The adapter is attempting to connect to a wireless network. Black with two antennae (wireless N adapter): The adapter is not recognized. Try plugging the adapter into a USB port on the front of your console. Grey with one antenna (wireless G adapter): The adapter is ready for the next step: Test your connection. The adapter might be experiencing a hardware failure. Order a new adapter from the Xbox Online Service Center. Test the wireless adapter in all of the USB ports on the Xbox 360 console. If the adapter works in one USB port but not another, try connecting another accessory to the USB port where the adapter didn’t work. If a USB port doesn’t work with any accessory, your console might need to be repaired. Submit an online repair request. See How to find your wireless network password. 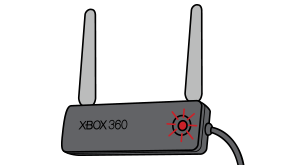 Would you like to contact Support regarding the "Troubleshoot your Xbox 360 Wireless Networking Adapter" issue you were reading about or a different issue?